M12, 12mm Female Molded Locking Euro-style solenoid and sensor round connectors feature metric locking, and are used for factory automation, commercial electronics, process control, and industrial instrumentation. Available in 3 pin, 250V AC/DC, 4 Amps max. The Canfield Series 5FFAC all-molded DIN solenoid valve connector/gasket/cord offer a completely molded plug and play design that interfaces female ISO (DIN 43650 Form “A”), MINI and 9.4mm (Industry Standard) and 8mm Sub-Micro (DIN 43650 “C”) solenoid connections to 8mm or 12mm (round) circular connectors. Made from rugged yet flexible polyurethane, the connector housing boasts high durability factors and application versatility. 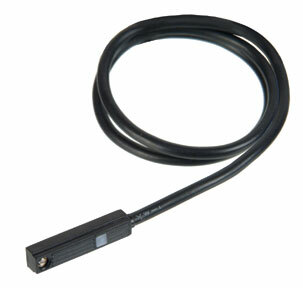 The low profile “straight line” interface/cord configuration allows for installation in many limited space applications. The integrated gasket design boasts an IP67/NEMA 6 rating, is far better for environmental integrity than field wire versions and makes it impossible to lose the gasket! The 5FFAC and 5JFAC are the only molded valve connectors in the industry that feature bi-directional indicator lights and load suppression (not intended for UL 1449). UL and CSA versions are available as well. The Series 5FFAC is proudly Made in the U.S.A. The Canfield Connector Series 9T is a compact yet robust switch used to sense position of magnetic pistons designed into aluminum extrusion type linear actuators. The 9T fits a 7.2mm X 3.9mm rectangular groove which is designed into the actuator body. Available in reed or electronic versions, the 9T features standard 9 ft. PVC or 8mm quick connect male pigtail, and are rated IP-67 against the ingress of dust and water.